KIEV, Ukraine -- Stray dogs in the streets of Ukraine's major cities have caused unexpected problems for UEFA in the run up to the 2012 European Championship. Local authorities have been killing the dogs in an effort to clean the streets before June, but the methods used have led to a public outcry and pressure on UEFA sponsors like Coca-Cola who in turn has demanded that UEFA takes action on the issue. Stray dogs have been a problem in many cities in Ukraine for years, and the NGO Animal Foundation Platform estimates that there are up to 30,000 stray dogs in the capital of Kiev alone. However, managing the population of dogs has also become big business for those in charge of stray animal control in the various cities - especially when big events come to town. "As soon as these announcements are made, those in charge of municipality stray animal control immediately demand increased budgets from their municipality, charging that because of the influx of foreign visitors, action must be taken to destroy stray animals. Such increased killing needs greater funds", the British NGO, Naturewatch, writes on its website. Naturewatch has been working closely with the Kiev Society for the Protection of Animals "SOS" for 15 years and also consulted widely with Ukrainian authorities on how to manage stray animals. Without much success, the organsation admits in a recent report about the protection of animals in Ukraine, and suggests that the reason can be found in corruption. "Despite Naturewatch’s support and training programmes and the overgenerous city budgets provided for Kiev Zoo and stray animal management, evidence suggests that animals that fall under the responsibility of the Kiev Municipality continue to be mistreated, neglected and unnecessarily killed." 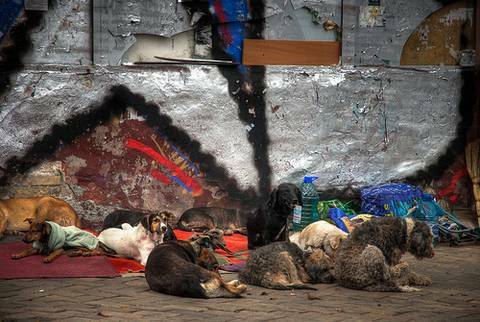 According to Naturewatch, the authorities in Kiev pay a private company a large sum of money to sterilise stray dogs. But evidence presented in the report suggests that instead dogs are being poisoined with zinc phosphate which leads to a painful death. Other media have been reporting that in the city of Lysychansk stray animals have been burned in a mobile incenerator - sometimes while they are still alive. These methods have led to a public outcry and pressure on both UEFA and its sponsors, even though UEFA has not requested that host cities get rid of stray dogs before the championships, as UEFA's Director of Communications, Alexandre Fourtoy, is at great pains to point out in a recent letter to a campaigner published on the website of the NGO, Animal Foundation Platform. "However, we are concerned about this issue and have taken it very seriously. We have used the extent of our influence to address this issue with the Ukranian authorities and have repeatedly asked those responsible to develop appropriate initiatives which respect the dignity of animals," writes Fourtoy in the letter. UEFA's desire to take this issue seriously may also stem from pressure by its sponsors. One of the major EURO 2012 sponsors, Coca-Cola, sent out a press statement a couple of weeks ago that stressed that Coca-Cola understands the outrage in Ukraine and the company is strictly against all forms for animal cruelty. "We are in dialogue with the UEFA, the organizer of the European Football Championship 2012, and we are sensitive to the concerns people have about the actions that have been taken in Ukraine to control the number of stray dogs," the statement reads. The pressure has been successful in the sense that Ukraine's environment minister, Mykola Zlochevsky, has announced an immediate ban on killing of dogs in the host cities. The Ukrainian authorities have also promised they will build animal shelters to house the animals, and that dogs that cannot be housed in shelters will be sterilised and released. At the moment is it not clear whether the ban on killing dogs will remain in force after the championship.